Redefining Optical Spectrum Measurement Excellence! The AQ6370B uses a newly developed high performance monochromator to achieve high wavelength resolution (0.02 nm) and wide close-in dynamic range (70 dB). With the sharper spectral characteristics of the new monochromator, OSNR measurement of 50 GHz spacing DWDM transmission systems and EDFA evaluation with multiple wavelength sources can successfully be performed. The AQ6370B can measure optical power as high as +20 dBm, which enables direct measurement of high power sources such as optical amplifiers and pump lasers for Raman amplifiers. Measurement sensitivity can be chosen from seven categories according to test applications and measurement speed requirements. The AQ6370B covers not only telecommunication wavelengths, but also the visible light wavelength region which is used for home electronics, medical, and industrial material applications. NORM Hold, NORM Auto, NORM, MID, and HIGH (1, 2, and 3), that correspond to sensitivity from -60dBm through -90dBm. SWITCH mode is to obtain a better dynamic range by reducing an influence of stray-light. They are applicable in MID and HIGH mode. The AQ6370B uses a free space input structure that can handle up to GI 62.5/125 multimode fiber. Multimode fiber is commonly used in high speed Ethernet network, such as GE-PON. The free space input is also beneficial for measurement repeatability as insertion loss variation at the input connector is smaller than the other input type which has an optical fiber inside the monochromator. The AQ6370B can catch the peak power of a pulsed signal using PEAK HOLD or using an externally provided trigger to synchronize with the measured signal. It can be applied to the transmission loop testing of telecommunication systems, and also to the low power measurement at the early stage of laser chip development since it works in the high sensitivity modes. The AQ6370Viewer is a package of the PC application softwares for AQ6370, AQ6370B, and AQ6375. 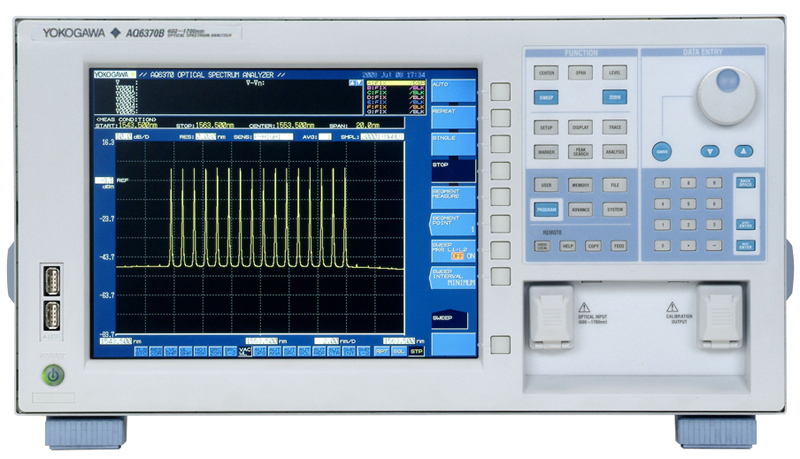 The AQ6370BViewer is designed to work with the AQ6370B Optical Spectrum Analyzer. It has the same user interface and functions as the AQ6370B so that you can easily display and analyze waveform data acquired by the AQ6370B. Trace data files saved on the AQ6370B can be retrieved and analyzed on a PC. Note. Measurement cannot be initiated in the Viewer mode. The remote control allows you to set measurement conditions and to execute a measurement on AQ6370B Optical Spectrum Analyzer from anywhere on the Ethernet network. Upon completion of a measurement on AQ6370B, AQ6370B Viewer downloads and shows the updated traces. Note. The program function is not supported. Some other restrictions may apply. Files can be exchanged between AQ6370B and PC. Program files edited on AQ6370B Viewer can also be transferred to AQ6370B. *Windows 2000 and Windows XP are registered trademarks of Microsoft Corporation of the United States. Applying a faster microprocessor and new algorithms, key response time and command processing time is drastically reduced. AQ6370B can achieve up to one hundred times faster response*. ETHERNET provides up to one hundred times faster data transfer speed than the GP-IB data transfer*. USB provides up to ten times faster data recording/retrieving speed to a removable memory device than the floppy disk*. GP-IB provides up to ten times faster data transfer speed than the conventional GP-IB*. 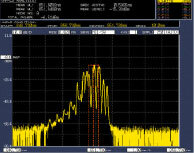 *In comparison with AQ6317 series optical spectrum analyzer. The AQ6370B is equipped with GP-IB, RS-232C, and Ethernet (10/100BASE) interfaces to be connected with an external PC for remote access and building an automated test system. It is compatible with a standardized programming language and supports AQ6317 commands for easy programming. Macro Program is a useful built-in function for making a simple auto test program. The SCPI is an ASCII text based standard code and format that conforms to IEEE-488.2. The standard remote commands of the AQ6370B are compatible with SCPI. It can be used with most computer test languages and test application software. 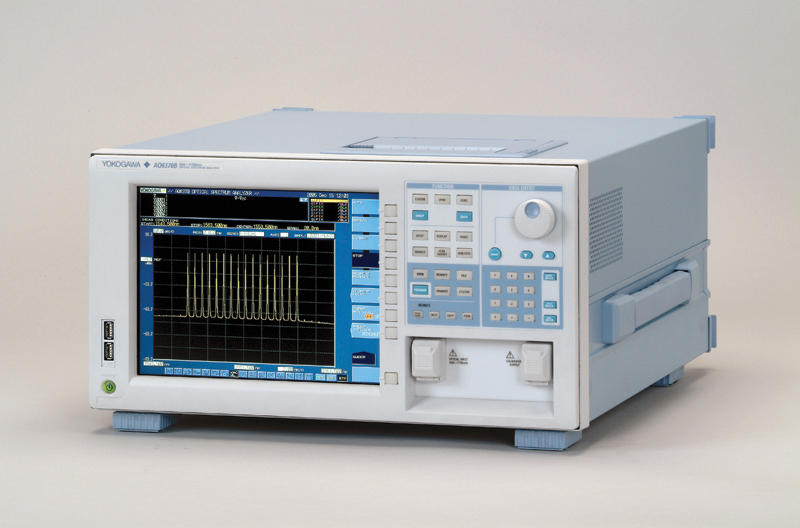 The AQ6317 series is Yokogawa's best-selling optical spectrum analyzer. Since there are so many existing users all over the world, the AQ6370B supports private remote programming codes and formats of the AQ6317 series to make it easier for users to upgrade their current test environment. Macro programming enables user to easily create test procedures by recording the user's actual key strokes and parameter selections. One program can contain up to two hundred program lines, and programs can be called as subroutines to make the main program simple. 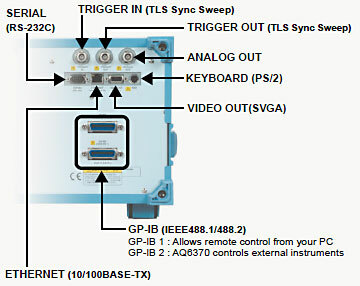 Moreover, macro programs can control external equipment through Ethernet, RS-232C and GP-IB port (GP-IB2). Therefore, an external PC is not required to build a simple auto test system. 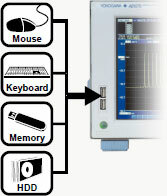 LabVIEW® is a popular test application software. 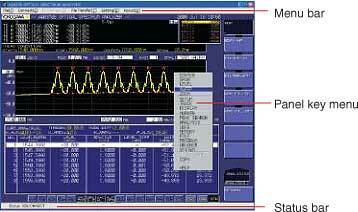 Yokogawa can provide users with LabVIEW drivers for the AQ6370B. Note. LabVIEW is a U.S. registered trademark of National Instruments. The AQ6370B inherits front panel operation and function key assignments from our conventional models that are proven intuitive and easy to use by our multitude of users. mouse operation when a parameter is selected. You can easily operate the AQ6370B with only a mouse instead of the front panel keys. Measuring conditions displayed on the trace screen can be changed directly by the mouse pointer. The keyboard is useful for entering labels and file names. The functions of panel keys appear by clicking right mouse button. Arrow pointer transforms into finger pointer when you move it to parameters. Trace zoom makes it possible to change display conditions, such as center wavelength and span, by clicking and dragging the mouse to select the designated area to enlarge. No need to make another sweep to refresh the display conditions anymore. The analysis function can be performed in the enlarged area. Once the trace is zoomed in, the overview window appears and shows the entire trace. By dragging the zoomed area border in this window with the mouse, the display area in the main trace window can be modified. In the Analysis Screen, traces can also be zoomed. 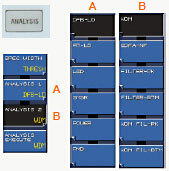 When a line item on the analysis result table is selected, the display area is automatically shifted and the corresponding signal is centered in the display area. This makes it easier to verify the accuracy of the analyzed data. The AQ6370B has a 128 MB user area in the internal memory that can save test setups, waveforms, analysis results, and macro program files. It is large enough to save more than five thousand traces. The waveform can automatically be judged to PASS or FAIL against specified conditions. 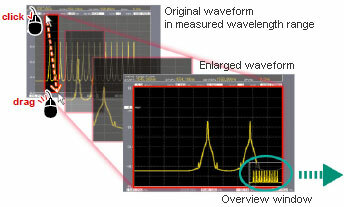 Using Template function upper and/or lower limits for the assessment can be set and measured waveform can automatically be compared. It is an effective way to reduce time and human error in assessment, especially for production line tests. The template data can be created and stored in the AQ6370B. It can be edited using a spread sheet on an external computer as well. Thirteen types of built-in analysis functions for popular applications can be selected by using Analysis function key on front panel or by mouse operation. The functions automatically perform designated analyses and provide results. The results can be saved in a storage device. All parameters for an individual analysis are displayed in a dialog box for easy setup. The AQ6370B has seven individual traces for measurement data. Some traces can be used for calculations (two-trace subtraction and addition), MAX/MIN hold, averaging, and curve fitting. The Curve fit function is an approximation technique to exclude an influence of noise and/or signal overlapping on the waveform. Curve fit method can be chosen from Gaussian, Lorenz, 3rd Poly, 4th Poly, and 5th Poly. Curve fit can be applied to an individual trace. Fitting area can be set by line markers (L1 and L2). When WDM or WDM-NF analysis is executed, one of the curve fit methods is used for a baseline measurement. The curve fit method can be specified in the parameter window of each analysis. 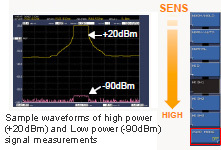 Noise level of amplified WDM signal can be estimated by using the curve fit in selected areas, even if noise between signals cannot be seen due to a limit of signal separation performance. The fitting curve can also be applied to the marker positions set by user. 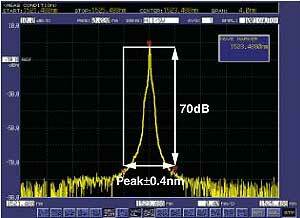 For example, this can be used to measure a modulated signal spectrum. The AQ6370B adopts a universal type optical connector system for optical input and calibration output enabling direct coupling to major optical connector types. The connectors can be replaced by users.